A small band turns big with Chester Bay. With a name inspired by a small body of water in the Midwest, Chester Bay did exactly what a body of water would do in the Midwest: they became great. 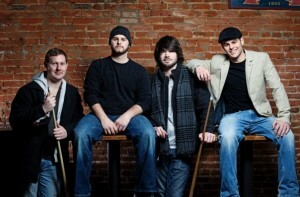 The band is comprised of four natives from the midwest who play like they were born to rock. I first found their music when my podcast, The Sideswipe, was in need of some creative push. After they sent me a song titled, “Get Free,” I could sense something in Chester Bay. I had a feeling that someday these men would be great. Other songs like “Late Night Ecstasy,” and “Fool’s Gold,” can only be mastered by artists of this caliber. These hits were only from their demo. In less than a year, while primarily touring in the Midwest, they have earned recognition in some of the nation’s best known magazines. They won the 2009 Landshark Battle of the Bands, beating over 450 other bands and gaining 13,000 votes from dedicated fans. As a token for their hard work, not only did Bay earn a number of prizes totaling over $100,000 but they also earned a full-page spread in March’s Rolling Stone. Chester Bay started in 2004, and since then they have stuck to their roots. The band’s inception was back in high school when two members met and moved to college together. It wasn’t until they arrived at the University of Wisconsin-Eau Claire that they met the other two members of the band. Within weeks of practice, a demo was released. After first listening to them, I was in total shock that a band of this potential remains unsigned. All of their hard work and dedication is from the personal blood, sweat and tears of every one of the members. They combine a melting pot of influences ranging from Dispatch to Sublime, using the upstroke that has made numerous ska and reggae bands popular for years. The members harmonize, layering melody using a harmonica, adding roots of blues into their music. Chester Bay is truly a testament to how hard work always pays off. Chester Bay’s newest album entitled “Get Free” is currently available on itunes and Rhapsody. Yes you did hit some things right in this article but there were MANY mistakes! For one thing Chester Bay comes from combining Rochester MN and Green Bay WI together. They do not come from Michigan. The drummer is from Green Bay WI, while the original other three band members all come from Rochester, MN. In the past year they lost their lead guitarist and picked up Mike Salow from the McNally Smith College of Music who is also a Minnesota native. The other big thing that you are missing is that the lead singer and bass guitarist our twins. The three from Rochester MN also were together before going to Eau Claire and they just met the drummer in Eau Claire. But I am glad that you like Chester Bay and I believe that both you and I both hope to see them go along way! does your site have anytype of RSS feed? Actually, their new guitar player Mike isn’t a Minnesota Native. He is from a small town in Iowa called Earlville. He does however attend the McNally Smith College of Music in Saint Paul, MN. cool! I saw these guys by chance out at the basilica block party. They rocked it hard, super high energy especially for the first band of the day. Glad to be sharing the stage with these guys! Our whole band also attended McNally Smith College of Music.